Late last year I posted about the work of Guatemalan photographer Daniel Hernández-Salazar. At the time I noted his 1998 polyptych (above) entitled Esclarecimiento ("Clarification"). 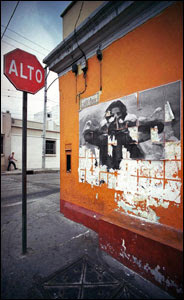 I think the images are striking and want to talk a bit about some of the various ways Hernández-Salazar has used them. 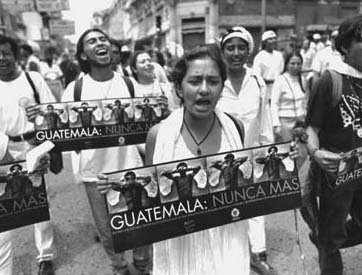 Between 1960 and 1996 Guatemalans endured a protracted, notably vicious civil war. As part of the negotiated end to the fighting, the Catholic Church initiated a project for the recovery of Historical Memory - Proyecto Interdiocesano de Recuperación de la Memoria Historica (REMHI). On April 24, 1998 the REMHI project issued a massive written report entitled Guatemala Nunca Mas that estimated that 200,000 civilians, disproportionately from the indigenous Mayan Indian population, had been killed during the civil war. The report concludes that the overwhelming majority of these deaths came at the hands of the Guatemalan military. ** The REMHI report consisted in four volumes. 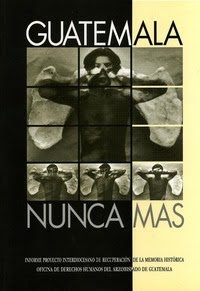 The cover of each volume carried one of the four images from Hernández-Salazar’s Esclarecimiento. The final volume, containing the names of over 50,000 victims of the civil war, features So That All Shall Know. The REMHI had been headed by Bishop Juan José Gerardi. Two days after the project released its report, the Bishop was bludgeoned to death. Ultimately four individuals - three of them military officers - were convicted of the murder. But the immediate aftermath of Bishop Gerardi's murder consisted in mass protests in Guatemala City. At these protests many marchers carried posters, each featuring Hernández-Salazar’s Esclarecimiento, that the REMHI project had printed to publicize its report. 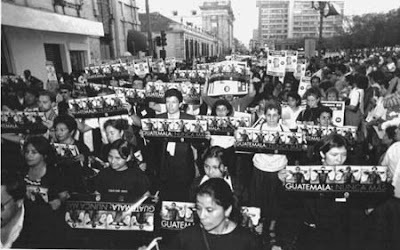 March of Silence, Guatemala City, (28 April 1998). May Day March, Guatemala City (1998). So here we have two uses of Hernández-Salazar’s Esclarecimiento. The first, he surely intended, the second he almost surely did not. To mark the first anniversary of Bishop Gerardi's murder, Hernández-Salazar installed much enlarged versions of Para que Todos lo sepan at some 36 locations around Guatemala City. Some of these locations were simply prominent public spaces, many were directly associated with the military. And many of the "Street Angels" were removed promptly by parties unknown. Military Intelligence, also in Guatemala City (April 1999). 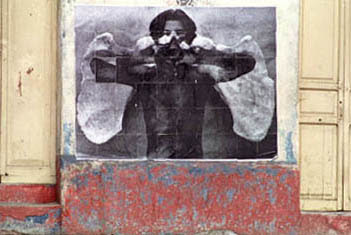 These "Street Angels" were reconstructed from sets of sixty 8 x 10 panels which allowed those installing them to reproduce them on photocopiers and to hang them in such a way that the larger image appeared only incrementally. This was not merely a technological convenience or aesthetic strategy. The effort to appropriate and redefine public space in Guatemala City was, at the time, obviously fraught with risk. In subsequent years Hernández-Salazar has incorporated large versions of Para que Todos lo sepan into a less localized project called Memoria de un ángel ("Memory of an Angel"). In this series of installations he took Para que Todos lo sepan abroad. The aim was to generalize the need to recognize and recall pain and suffering in diverse circumstances. Fort Malbry - Austin, Texas (2003). While I understand the impulse to generalize here, it seems to me that Para que Todos lo sepan loses some of its force and especially its political force as Hernández-Salazar moves it farther and farther from its local context. 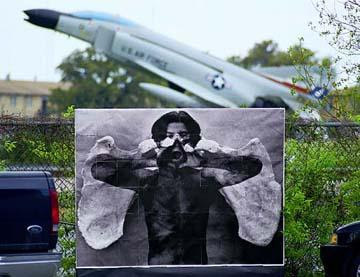 Given the complicity of the U.S. in the sordid political history of Guatemala - and of Latin America more generally - the installation outside American military installations makes some sense. 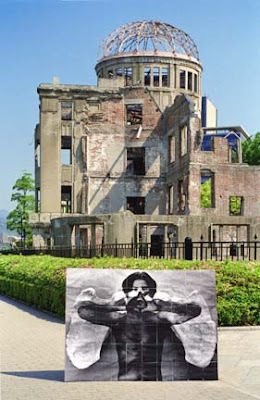 But moving to memorials for the victims of American use of atomic weapons risks rendering both Hernández-Salazar's image and the memorial site itself banal - each becomes a more or less routinized or ritualistic gesture. 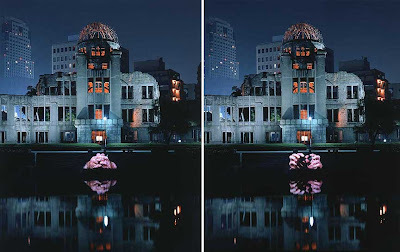 Indeed, the installation at Hiroshima immediately brought to mind a 1999 projection that Krzysztof Wodiczko did at the same site. Hernández-Salazar's "Street Angel" draws its power largely from the streets it inhabits. The profound impact of the image (and its partners), it seems to me, relies upon a distinctively local resonance. That does not deprive them of power; it merely identifies the source of the work's vitality. The farther it is removed from that original context, the more it is compelled to assume the guise or the concern for humanity writ large, the less political it becomes. That is a cost that in this case - and in others - we should resist paying. In saying that I do not mean to diminish the importance of Para que Todos lo sepan. It is, I believe, a truly profound work. To the contrary, I hope to draw a general lesson from it. * My acquaintance with Hernández-Salazar, his work and the historical context in which he produced it derives from the volume I mentioned in my earlier post. ** These conclusions are generally corroborated by the report of a UN sponsored truth commission - Comisión para el Esclarecimiento Histórico (CEH). a very interesting and well presented post, a grass-roots project that has impact and power to change social reality. i think that you are right in saying the copy-machine images have more impact than a "reenactment" in another time-place. I was in Guatemala in 1978-79 and the consensus was that in-country protest was impossible due to the oppression of military-backed government violence and atrocities against indigenous peoples....assasinations, be-headings were common and were a message of fear. The fact that protesters carry the images is proof that a photo can initiate courage and change. a very interesting read, goes to show the power that art has and how photography (at least in my opinion) tops the chart. Thank you for sharing this. I am so glad that you posted Daniel Hernandez-Salazar work. It is oustanding. I know him personally and his work matches perfectly his character. "I'm A Photographer Not a Terrorist"